Summer had arrived with a vengeance. A delightfully sunny morning greeted us through Billy’s sun roof. Barry and Irene had offered to show us something of Somerset’s attractions and, as we were already somewhat familiar with the Somerset levels, we decided upon an introduction to the Quantock Hills. Deplorable booze situation fixed, Barry and Irene duly arrived and we loaded the walking boots and set off for the Quantocks. These turned out to be delightfully rolling hills largely, where we were at least, covered in some very traditional broad-leafed woodland. 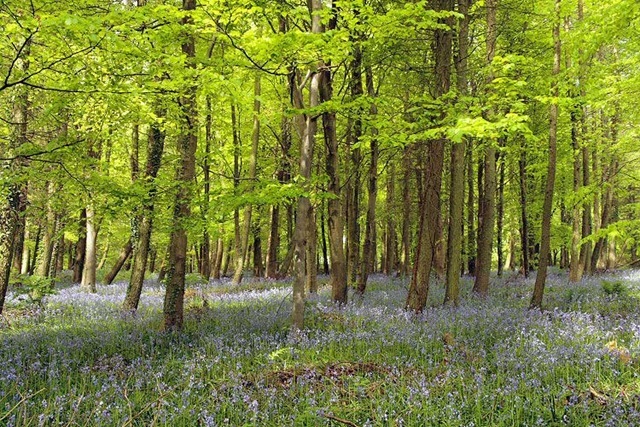 It makes such a change to see the beautiful fresh green of beech trees instead of the dark and somber, all-too-common managed conifer plantations under which bluebells would stand no chance. (Nor, indeed, does anything else.) As well as the expected footpaths, there were tracks for the more energetic mountain bikers, too. Probably because it was a good day for thermal activity, buzzards a-plenty were whirling about keeping us entertained on our walk. It’s as well to ignore the small blot on the distant landscape that is the Butlins holiday camp in Minehead but, being so far away, that is easily done. We returned to more than replace our used calories with further rounds of eating and drinking before bidding farewell to our hosts for their excellent hospitality. Somerset bears further investigation. I still have to taste some traditional Somerset cider. I just hope your mum has no access to the internet. But I fear you are set for blackmailing by Carol’s relations. Now we know why the rush to France. And keep up the blogging while you are there! It has brightened many a boring day. I’m so glad the entertainment is appreciated – by at least one reader. I fear there aren’t many. I must investigate the use of Technorati tags in an attempt to widen the audience. Some of the offline blogging software has that capability included. Maybe one of those wouldn’t keep messing with the publish date, unlike Windows Live Writer (which I have found to be otherwise excellent).